A Nash equilibrium (NE) is an optimal strategy in game theory, given that all players have differing payoffs for different strategies. It is a strategy that, when all players have full knowledge of their own and their opponents’ payoffs for each strategy, every rational player will choose. For this application the three "players" are 1) the complexity or computational cost of the method, 2) the accuracy of the method for a benchmark set, and 3) the similarities of the system of interest with the molecules in the benchmark set. Scores for each player are entered into a payoff matrix and then fed to the Gambit program that computes the Nash equilibria, which are then converted into a score for each combination of functional and basis set. The method, called Decider, is made available as via a web-interface. The method is for the benzene dimerization energy using the S22 benchmark set (where the benzene dimer has been removed). The top 81 functional/basis set combinations are given and the top five, middle five, and bottom five combinations are tested, i.e. the benzene dimerization energy is computed and compared to the reference value. As expected, the top five combinations are among both the fastest and most accurate of the 15 combinations tested. Because the molecules in the benchmark set are all quite small, Decider invariably suggested the def2-QZVP basis because it affordable for these kinds of systems and provides accurate results (in fact this happens for every molecule pair I have tried to far). As far as I can tell the version available via the web interface is based on the S22 benchmark, so it can only be used for interaction energies at present. 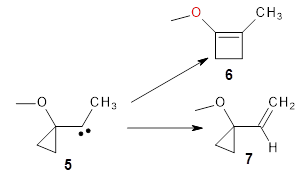 Every molecule I have tried to far has led to def2-QZVP as the only basis set suggestion. Unfortunately, it doesn't appear that the source code is available. The source code is available on Github. The authors have also set up a Turing test of the method. I seem to be recently flooded with papers dealing with tunneling in organic systems. Well, here’s one more! 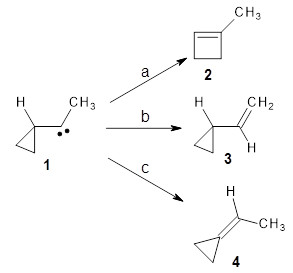 Kozuch, Borden, Schreiner and co-workers seek out systems whereby isotopic substitution might lead to reaction selectivity.1 Their base system is cyclopropylmethylcarbene 1, which can undergo three different reactions: (a) the ring can expand to give 1-methylcyclobut-1-ene 2, (b) a hydrogen can shift from the terminal methyl group to give vinylcyclopropane 3, or (c) the methane hydrogen can shift to produce ethylidenecyclopropane 4. This last option can be neglected since its barrier (20.5 kcal mol-1) is so much higher than for the other two, 7.5 kcal mol-1 for the ring expansion and 12.1 kcal mol-1 for the [1,2]H-shift converting 1 → 3. At high temperature, the ring expansion to 2 will dominate, but at low temperature the hydrogen shift to 3might dominate by tunneling through the barrier due to the low mass and short distances involved. The reaction rates were computed using B3LYP/6-31G(d,p) and small-curvature tunneling. At low temperature, the rate for the hydrogen shift is 10 orders of magnitude faster than the ring expansion. Thinking that deuterium substitution of the terminal methyl group might slow down the rate of the [1,2]-shift, they computed the rates for the reactions of 1-d3, and in fact the rate of this shift does reduce by 104 but it is still much faster than the rate for ring expansion. What is needed is a system where the rate for ring expansion is slower than the rate for hydrogen migration but faster than the rate of deuterium migration. They examine a number of different substituents that may help to lower the barrier for the ring expansion. The methoxy derivative 5 turns out to suit the bill perfectly. The methoxy group reduces the barrier for ring expansion from 7.5 kcal mol-1 with 1 to 2.5 kcal mol-1 with 5. With hydrogenated 5, the [1,2]H-shift is 103 times faster than ring expansion, but with deuterated 5, ring expansion is twice as fast as the deuterium migration. The authors call this isotope controlled selectivity (ICS), and this is the first example of this type of control. 1. Nandi, A.; Gerbig, D.; Schreiner, P. R.; Borden, W. T.; Kozuch, S., Isotope-Controlled Selectivity by Quantum Tunneling: Hydrogen Migration versus Ring Expansion in Cyclopropylmethylcarbenes. J. Am. Chem. Soc. 2017, 139, 9097-9099, DOI: 10.1021/jacs.7b04593. Antiaromatic compounds by definition are unstable and so difficult to prepare. One approach to increase their stability is to fuse aromatic ring(s) onto the antiaromatic system. I discuss in this blog post two different scaffolds where this approach has been successful in preparing molecules that express some degree of antiaromaticity. In addition, I mention a technique to aid in evaluating the aromatic/antiaromatic character. Pentalene 1 is a formal 8-π electron system and would be antiaromatic. To avoid this antiaromatic character, the double bonds are localized. Fusing benzenoid rings to pentalene to give dibenzo[a,e]penatalene 2 has been done, but the central rings avoid antiaromatic character by expressing the Kekule structure shown below. 3.1 Resonance structures of 3¸ shown below, either have only one aromatic ring, or have two aromatic rings along with a trimethylenemethane (TMM) diradical component. Thus, one might expect 3 to express more antiaromatic character than 2. NICS(1) values, computed at B3LYP/6-31G**, for 2 are -6.23 for the 6-member ring and +5.87 ppm for the 5-member ring, showing reduced aromaticity of the former ring. 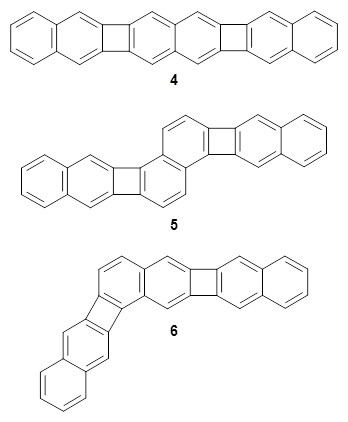 In sharp contrast, the NICS(1) values for 3 are +7.48 for the 6-member ring and +25.5 ppm for the 5-member ring, indicating substantial antiaromatic character for both rings. The calculated spin density distribution shows largest unpaired density on the expected carbon atoms based on the resonance structures involving the TMM fragment. Xia and coworkers have prepared substituted analogues of the three structural isomers whereby three naphthylene units are fused together creating two cyclobutadienoid rings.2 These three frameworks are molecules 4-6. The 4-member rings are formally antiaromatic, tempered by the fused aromatic naphthylene groups. 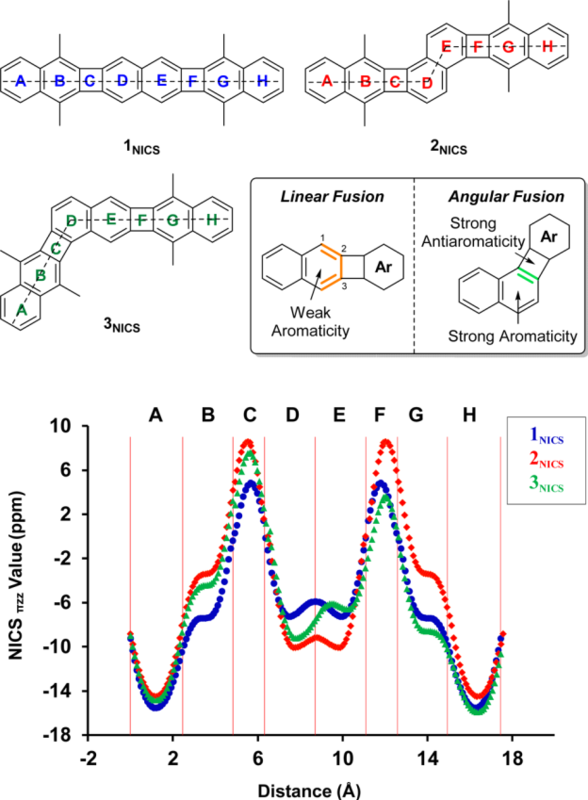 The question is then how does the different attachment geometry manifest in aromatic and/or antiaromatic character? The computations take advantage of the NICS-XY method – well, a variation of this method. I had meant to write a post about the NICS-XY method when Stanger published it,3 but I just never got around to it. The idea is that NICS is evaluated typically at a single point, and just which point to use has been the subject of some discussion. Instead, Stanger proposes the NICS-XY method as a grid of points perpendicular to the plane of the molecule, typically in the plane bisecting the molecule. Trends in the values as one moves across the ring and perpendicular to the ring could assist in identifying aromatic/antiaromatic behaviour. Xia computed the NICSπZZ along a line in the molecular plane bisecting the rings. This is shown in the figure below, which I have reproduced from the article. For example, for 4, which is compound 1 in the Xia paper and the figure below, the NICS values are taken along the line that horizontally bisects the molecule. In ring A, the values are negative, indicative of an aromatic ring. Across ring B, the values are still negative, but not as negative as for ring A, indicating a diminished aromaticity. In ring C, the values are positive, as one would expect for the antiaromatic cyclobutadienoid ring. Figure taken from J. Am. Chem. Soc. 2017, 139, 15933-15939. The authors highlight two trends. First, in the linear fusion (see the inset above), the aromatic ring fused to the cyclobutadienoid ring expresses diminished aromaticity. This can be understood in the following way. In naphthalene, the C2-C3 bond is longer than the C1-C2 bond. When the cyclobutadienoid is fused at the C2-C3 bond, it can lengthen even more to weaken the antiaaromaticity of the 4-member ring, and this consequently reduces the aromaticity of the 6-member ring. Fusion of the cyclobutadienoid ring at C1-C2, the shorter bond, causes a higher degree of antiaromaticity in the 4-member ring. The lengthening of this C1-C2 bond to try to reduce the antiromaticity of the 4-member ring leads to greater bond equalization in the 6-member ring, and its consequently greater aromatic character. 1. Konishi, A.; Okada, Y.; Nakano, M.; Sugisaki, K.; Sato, K.; Takui, T.; Yasuda, M., "Synthesis and Characterization of Dibenzo[a,f]pentalene: Harmonization of the Antiaromatic and Singlet Biradical Character." J. Am. Chem. Soc. 2017, 139, 15284-15287, DOI: 10.1021/jacs.7b05709. 2. Jin, Z.; Teo, Y. C.; Teat, S. J.; Xia, Y., "Regioselective Synthesis of Naphthylenes and Tuning of Their Antiaromaticity." J. Am. Chem. Soc. 2017, 139, 15933-15939, DOI: 10.1021/jacs.7b09222. 3. Gershoni-Poranne, R.; Stanger, A., "The NICS-XY-Scan: Identification of Local and Global Ring Currents in Multi-Ring Systems." Chem. Eur. J. 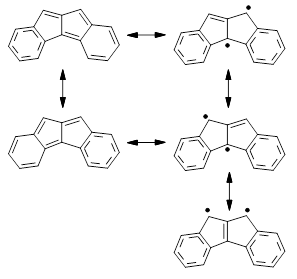 2014, 20, 5673-5688, DOI: 10.1002/chem.201304307.